Today is the day! The Made With Love Giveaway Hop is here! Use the simple Rafflecopter form below to enter to win the Silver Spinner Ring from Bespoken Jewelry! This ring retails for $55! The Sterling Silver Spinner Ring! Spinner (or fidget) rings are fun and versatile! Hand forged from recycled sterling silver, the interior is smooth and polished for comfort while the outside is textured to look like wood (faux bois). Patina is applied to add drama, giving the ring a lovely organic look. Two bands of brightly polished silver spin within the curved walls of the band for you to play with. It looks great on both men or women, dressy or casual. The ring is about 10mm (3/8”) wide and can be custom made to the size you need (size 5 to 10 including half sizes). 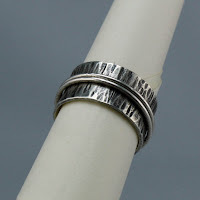 Wide band rings fit tighter than rings with narrow bands, so a good rule of thumb is to add a half size to your normal ring size when ordering. Made to order rings usually take about 5 days before shipping. Each is handmade so please expect some variation from the picture. 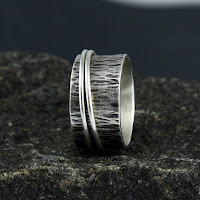 A good post about spinner ring.